IceChat can connect to many IRC Servers, has full scripting support and customizable popup menus, and a unique, easy to use Interface. It has emoticon support, skins, Full DCC Support, easy to setup for Multi Servers, with a very easy to use Server Tree. 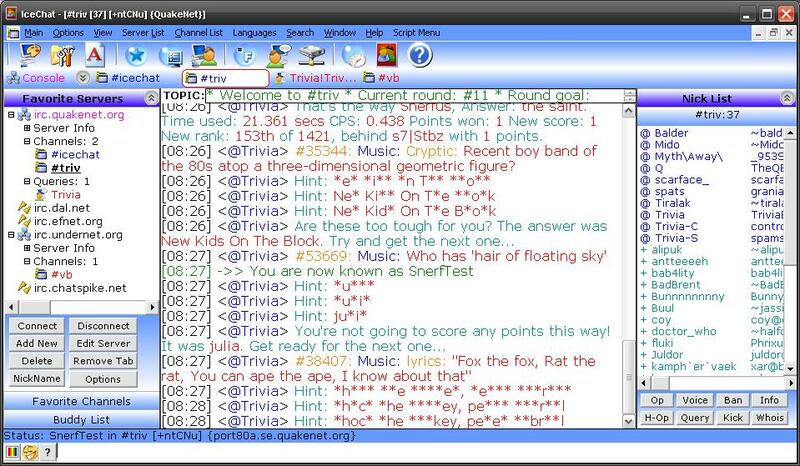 IceChat is in constant development, and is aimed at the Beginner to Intermediate IRC User. Qweas is providing links to IceChat IRC Client 7.70 as a courtesy, and makes no representations regarding IceChat IRC Client or any other applications or any information related thereto. Any questions, complaints or claims regarding this application IceChat IRC Client 7.70 must be directed to the appropriate software vendor. You may click the publisher link of IceChat IRC Client on the top of this page to get more details about the vendor.